When it comes to online advertising for small business, there’s a lot of information, and unfortunately, misinformation too. One blog tells you to focus on social media; another tells you to spend your money on search ads. As a result, you might wonder if you should use Google or Facebook to advertise your small business online. When it comes to growing a business, most of us want all the help we can get. These days this means not limiting yourself and using every tool you have in your arsenal. The more tools you can use to attract customers, the better. That’s why we should think of both Google Ads and Facebook as highly effective advertising tools. They both are powerful vehicles that have a place in your digital advertising arsenal. 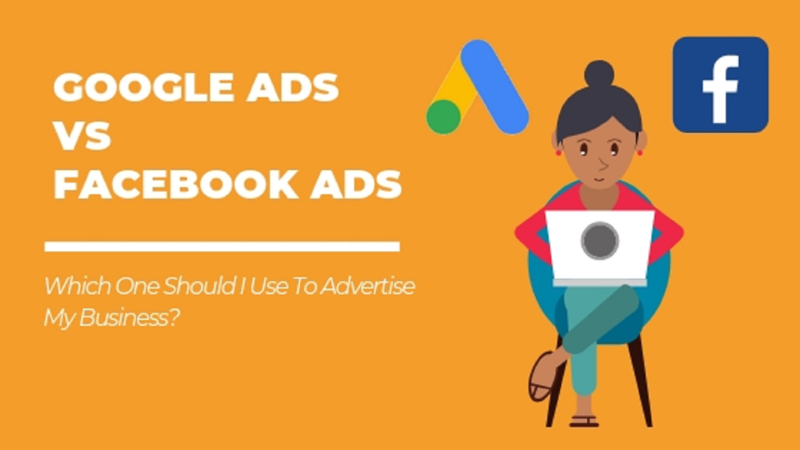 Let’s take a look at both Google Ads and Facebook Ads as well as how the two platforms work both alone and together. In 2018, Google rebranded it’s advertising platforms and tools, including Google Adwords, under one name, Googler Ads. Google Ads is actually a group of things that includes Search Ads, Display Ads, and Remarketing Ads, as well as a host of other advertising related tools. Because advertising on Google is such a vast topic, we won’t go in depth into every aspect for this post. Instead, below you’ll learn a little about three of the most common PPC campaign types. Search ads are advertisements that appear at the top or bottom of the results page. These ads can also appear on other websites from Google search partners. Search ads when used to advertise for local businesses or businesses in a specific geographic area. As a small local business, you may be most familiar with this type of PPC advertising. Display ads debut on websites within the Google Display Network, which is a network of millions of websites, blogs and apps that the audience you are seeking uses. These ads differ from search ads because they are responsive and often have images and videos. They aren’t generated from a search. Instead, they appear on sites related to a person’s search history. Remarketing ads zero in on people who have visited your site but didn’t buy your products or services. This type of digital advertising helps to draw potential customers back to your company because they have already shown interest. Think of these people as warm leads versus cold leads. These ads can also show a specific product or service that your site visitor looked at but didn’t purchase. You may have heard Google advertising referred to as pay per click advertising or PPC. In reality, there are more ways to count interactions with your ads, but clicks and the term PPC are what most people know. Google advertising rests heavily on targeting keywords. Businesses bid on specific keywords and pay a fee every time a Google user clicks on the advertiser’s ad. Basically, businesses purchase the opportunity to find a potential customer by paying a fee every time a Google user clicks on one of their ads. Conversely, Facebook ads are paid advertising geared toward social media. Facebook ads help businesses by attracting customers through their relevant interests and online behavior. These ads are still a type of PPC ad, but you will usually hear people call them social media advertising or Facebook advertising. Facebook has more active monthly users than any other social media platform in the world. These ads bring new customers to your business whereas Google Ads helps companies find new customers. It’s the fundamental difference between Facebook ads and Google Ads. Google has a profound reach when it comes to all the people who use it daily. In fact, 3.5 billion searches are conducted on Google every day. This reach provides businesses with a tremendous opportunity to build brand awareness and acquire more customers. With forty thousand searches being performed every second, there are plenty of opportunities to find more customers and dramatically increase brand exposure. The enormous volume of searches is perhaps why Google Ads is the most popular PPC platform in the world. Google Ads creates a level playing field by rewarding advertisers who create the most relevant ads. Plus, advertisers can utilize a wide variety of different ad formats. Google combines relevance with user experience to create a quality score. Facebook ads may not have the history that Google Ads has but it is still a force to be reckoned with. Like Google Ads, Facebook Ads have a vast global audience at their disposal. Facebook has over 1.55 billion active monthly users. However, Facebook’s power is greater than the number of people it’s able to reach. Its real strength is the detail and tools available for advertisers to succinctly focus in on a target audience. Part of this power lies in the ability to create a lookalike audience to grow their customer base. Facebook ad targeting means businesses can use data about their existing customers to create filters to find potential customers that are similar to their existing customers. Lookalike audiences allow businesses to be extremely specific to find the exact audience they are trying to target. Essentially, this makes it easy for businesses to find customers who have the same interests and shopping behaviors as their current customers. In addition to the ability to create lookalike audiences, Facebook ads are effective because they are visually compelling. This alone is a draw when it comes to attracting customers. These ads complement the other visual elements of the Facebook background. They appear in page feeds along with status updates and everything else and flow seamlessly. Facebook ads also have the ability to hyper focus on a particular audience which helps dramatically improve a business’s return on their investment or ROI. It’s clear that both Facebook ads and Google Ads are effective tools when it comes to advertising your small business on the internet. That leads us to the question: Which advertising platform should you use to promote your business? It really depends on what your goals are. Different strategies are effective for different purposes. Google may be a better choice when it comes to one advertising goal while Facebook may be better when it comes to another, and there are also going to be times when you should use both. The smart business person should become familiar with both and learn when to use each one as well as when they can effectively be used together. Clearly, paid search and paid social have a ton of benefits. They are both powerful advertising tools and can often be used together to expand your reach and attract your target audience. There’s a lot more to consider when it comes to digital advertising and marketing your small business online. If you need help or still have questions about how Google Ads and Facebook Ads work, don’t hesitate to contact us. And don’t forget to subscribe to this blog to receive more marketing tips and strategies delivered right to your inbox.